250mg CBD Everyday is our pure, organic, Kentucky-grown, farm fresh full-spectrum CBD infused in organic Hemp Seed oil, Copaiba Essential Oil, Frankincense Essential Oil, and Peppermint Essential Oil. This full-spectrum tincture is a great way to start your health and wellness. Ideal for beginners and veteran users alike in a convenient 1-ounce bottle for a quick, simple way to take wherever you are. 250mg CBD Everyday has a deep green color and fresh, minty flavor from the Peppermint essential oil; you can taste the goodness in every drop. The Copaiba essential oil, which is also a cannabinoid, strengthens the CBD. CB1 receptors interact with THC (the active constituent in marijuana) and cause psychotropic effects. CB2 receptors, the target of both CannaBiDiol (CBD) oil and Copaiba essential oil, don't make you "high" when affected. Found mostly in the immune system, CB2 receptors assist with inflammation and certain kinds of pain when affected by cannabinoids. Unlike CBD oil, which can contain varying amounts, Copaiba essential oil contains 0% THC.Copaiba oil contains high levels of beta-caryophyllene (BCP), a cannabinoid that interacts directly with the CB2 receptors in our body and may be neuroprotective and have cardiovascular and immune benefits. Beta-caryophyllene is also found, in lower levels, in other essential oils like Black Pepper and Melissa. 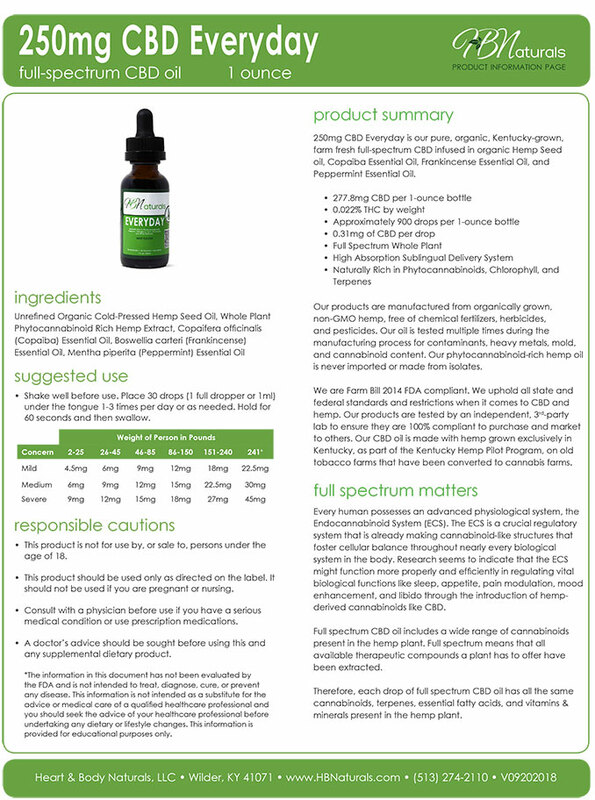 Third-party testing for Everyday Lot #25018170-8(1) shows the total CBD contained in the 1-ounce (30mg) bottle is 277.8mg (9.26 mg x 30). Additionally, at 0.022% by weight, the THC level is well below the Federal Farm Bill level of 0.3%. Testing results show it to be 100% pure.